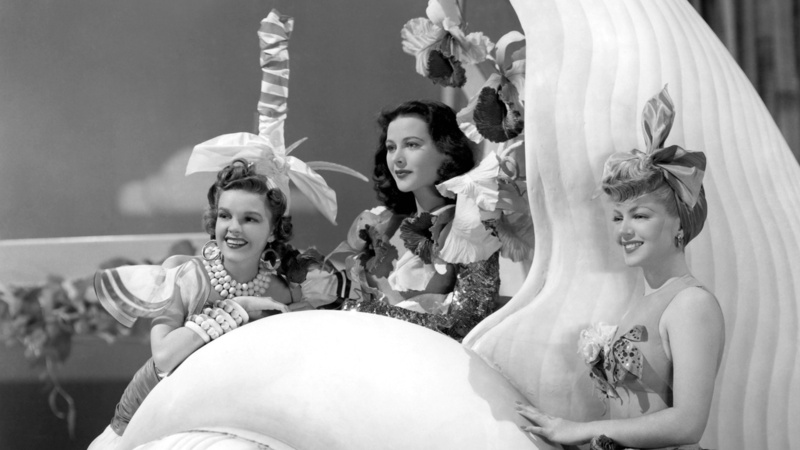 A musical drama, Ziegfeld Girl examines the consequences of sudden fame on the lives of three women thrust into the spotlight. It's the 1920s, and legendary Broadway impresario Florenz Ziegfeld (who is never seen) is recruiting girls for his next big "Ziegfeld Follies" show. Sheila Regan (Lana Turner) is spotted working as a department store elevator girl. She is in love with her truck driver boyfriend Gil (James Stewart), but anyway joins the show. Young vaudeville performer Susan Gallagher (Judy Garland) is also recruited, although she is reluctant to leave her father Pop (Charles Winninger), a long-time vaudevillian, behind. Sandra Kolter (Hedy Lamarr) is supporting her husband and classical violinist Franz (Philip Dorn) as he desperately seeks employment when she is offered a role in the Follies. Franz cannot accept his wife wearing skimpy outfits and parading in front of strangers, and leaves her. The three girls make their debut, and their lives change forever. Sheila attracts the attention of the wealthy Geoffrey Collis (Ian Hunter), and embraces an alcohol-fuelled and lavish but shallow lifestyle, leaving Gil behind. Her brother Jerry (Jackie Cooper) befriends Susan, who has to adapt her singing style to appeal to more sophisticated audiences. And Sandra starts a relationship with the show's lead singer Frank Merton (Tony Martin), although they are both married. Ziegfeld does not appear in a movie carrying his name, the black and white cinematography takes away from the spectacle, the running time of 132 minutes is too long, the sappy melodrama sometimes drips off the screen and some of the song-and-dance numbers include recycled footage from The Great Ziegfeld (1936). And yet, Ziegfeld Girl still works remarkably well as an elaborate and multi-faceted drama about the price of fame. MGM unfurls the full glamour treatment in showcasing burgeoning stars Stewart, Garland, Lamarr and Turner in the lead roles, and the film is a whirlwind look at the shockwave of stardom as experienced by women offered an opportunity of a lifetime but no guarantees about the consequences. The performance number do cause bloat, so director Robert Z. Leonard compensates by maintaining fairly zippy pacing in the narrative scenes, and teases out the dilemmas facing the women. For all three, the abandonment of their pre-fame man is a turning point. It's almost possible to sympathize with Sheila as she luxuriate in her Park Avenue apartment, admiring her numerous evening gowns and expensive jewelry, and drowning her guilt at abandoning Gil in copious amounts of alcohol. Although her story is the most prominent, Susan and Sandra also get plenty of screen time. Sandra is more pragmatic, choosing a job and salary with the Follies over poverty and starvation with Franz. And 17 year old Susan has perhaps the most difficult separation to endure: her father will carry on his touring vaudeville show without her, and she will have to unlearn most of what he taught her. Ziegfeld's shows are lovingly recreated in the musical numbers directed by Busby Berkeley, including the traditional descending-the-stairs moments and the ridiculous over-the-top costumes and head wear. But the movie's highlights are the unexpected nuggets on the sidelines of the main show: Susan salvaging her audition by quickly understanding the need for subtlety in delivering I'm Always Chasing Rainbows; and later her dad getting his unexpected chance to shine in Mr. Gallagher and Mr. Shean. Ziegfeld plucked girls from obscurity, taught them how to prance on-stage, and gave them a shot at accelerated stardom. The bright lights were enlightening for some, but blinding for others.